^ PRNewsWire. "Equatorial Guinea Adds Portuguese as the Country's Third Official Language". Retrieved 18 July 2015. ^ "World Directory of Minorities and Indigenous Peoples – Equatorial Guinea : Overview". UNHCR. 20 May 2008. Archived from the original on 13 January 2013. Retrieved 18 December 2012. ^ Dickovick, James Tyler (2012). Africa 2012. Stryker Post. p. 180. ISBN 1-61048-882-2. Retrieved 18 December 2012. ^ a b c d e f Equatorial Guinea. Cia World Factbook. ^ "Equatorial Guinea country profile". BBC. 20 August 2017. ^ "Equatorial Guinea". freedomhouse.org. 4 January 2018. Retrieved 17 April 2019. ^ "Africa :: Equatorial Guinea — The World Factbook - Central Intelligence Agency". www.cia.gov. Retrieved 17 April 2019. ^ "2015 Census Preliminary Results" (PDF). inege.gq. Archived from the original (PDF) on 15 June 2016. ^ a b "Report for Selected Countries and Subjects". www.imf.org. Retrieved 17 April 2019. ^ a b "2018 Human Development Report" (PDF). United Nations Development Programme. 2016. Retrieved 21 March 2017. ^ "INEGE | INSTITUTO NACIONAL DE ESTADÍSTICA DE GUINEA ECUATORIAL". www.inege.gq (in Spanish). Retrieved 19 April 2017. ^ GDP – per capita (PPP) – Country Comparison. Indexmundi.com. Retrieved on 5 May 2013. ^ GDP – per capita (PPP), The World Factbook, Central Intelligence Agency. ^ Equatorial Guinea – Reporters Without Borders Archived 15 October 2010 at the Wayback Machine. En.rsf.org. Retrieved on 5 May 2013. ^ "Equatorial Guinea". Trafficking in Persons Report 2012. U.S. Department of State (19 June 2012). This source is in the public domain. ^ Bostoen (K.), Clist (B. ), Doumenge (C.), Grollemund (R.), Hombert (J.-M.), Koni Muluwa (J.) & Maley (J. ), 2015, Middle to Late Holocene Paleoclimatic Change and the Early Bantu Expansion in the Rain Forests of Western Central Africa, Current Anthropology, 56 (3), pp.354-384. ^ "Fernando Po", Encyclopædia Britannica, 1911. ^ Martino, Enrique (2012). "Clandestine Recruitment Networks in the Bight of Biafra: Fernando Pó's Answer to the Labour Question, 1926–1945". International Review of Social History. 57: 39–72. doi:10.1017/s0020859012000417. ^ Castillo-Rodríguez, S. (2012). "La última selva de España: Antropófagos, misioneros y guardias civiles. Crónica de la conquista de los Fang de la Guinea Española, 1914–1930". Journal of Spanish Cultural Studies. 13 (3): 315. doi:10.1080/14636204.2013.790703. ^ Crowder, Michael, ed. (1984) The Cambridge History of Africa: Volume 8, from C. 1940 to C. 1975. Cambridge: Cambridge University Press, ISBN 0521224098. ^ Campos, Alicia (2003). "The decolonization of Equatorial Guinea: the relevance of the international factor". Journal of African History. 44 (1): 95–116. doi:10.1017/s0021853702008319. ^ "Equatorial Guinea - EG Justice". www.egjustice.org. Retrieved 17 April 2019. ^ "Equatorial Guinea - Mass Atrocity Endings". Tufts University. 7 August 2015. ^ a b Aworawo, David. "Decisive Thaw: The Changing Pattern of Relations between Nigeria and Equatorial Guinea, 1980–2005" (PDF). Journal of International and Global Studies. 1 (2): 103. Archived from the original (PDF) on 24 January 2013. ^ Sengupta, Kim (11 May 2007). "Coup plotter faces life in Africa's most notorious jail". London: News.independent.co.uk. Archived from the original on 29 December 2007. Retrieved 3 May 2010. ^ "True hell on earth: Simon Mann faces imprisonment in the cruellest jail on the planet". London: Dailymail.co.uk. 18 May 2007. Retrieved 3 May 2010. ^ Daniels, Anthony (29 August 2004). "If you think this one's bad you should have seen his uncle". London: Telegraph.co.uk. Retrieved 22 May 2014. ^ "The Five Worst Leaders In Africa". Forbes. 9 February 2012. ^ BBC (14 November 2014) Equatorial Guinea profile. ^ "DC Meeting Set with President Obiang as Corruption Details Emerge". Global Witness. 15 June 2012. ^ Empresas portuguesas planeiam nova capital da Guiné Equatorial. africa21digital.com (5 November 2011). ^ Atelier luso desenha futura capital da Guiné Equatorial Archived 15 October 2015 at the Wayback Machine. Boasnoticias.pt (5 November 2011). Retrieved on 5 May 2013. ^ Arquitetos portugueses projetam nova capital para Guiné Equatorial Archived 10 May 2013 at the Wayback Machine. Piniweb.com.br. Retrieved on 5 May 2013. ^ Ateliê português desenha futura capital da Guiné Equatorial Archived 22 January 2012 at the Wayback Machine. Greensavers.pt (14 December 2011). Retrieved on 5 May 2013. ^ Simon, Allison (11 July 2014). "Equatorial Guinea: One man's fight against dictatorship". The Guardian. Retrieved 9 May 2017. ^ a b BBC News – Equatorial Guinea country profile – Overview. Bbc.co.uk (11 December 2012). Retrieved on 5 May 2013. ^ Vines, Alex (9 July 2009). "Well Oiled". Human Rights Watch. Retrieved 21 January 2011. ^ Shaxson, Nicholas (17 March 2004). "Profile: Equatorial Guinea's great survivor". BBC News. ^ "Thatcher faces 15 years in prison". The Sydney Morning Herald. 27 August 2004. ^ MacKay, Neil (29 August 2004). "The US knew, Spain knew, Britain knew. Whose coup was it?". Sunday Herald. Archived from the original on 14 May 2011. ^ "Equatorial Guinea, A trial with too many flaws". Amnesty International. 7 June 2005. Archived from the original on 12 February 2006. ^ "Presidential Decree". Republicofequatorialguinea.net. Archived from the original on 26 April 2010. Retrieved 3 May 2010. ^ Heather Layman, LPA (11 April 2006). "USAID and the Republic of Equatorial Guinea Agree to Unique Partnership for Development". Usaid.gov. Archived from the original on 5 June 2011. Retrieved 3 May 2010. ^ Organizational Reform & Institutional Capacity-Building. MPRI. Retrieved on 5 May 2013. ^ Equatorial Guinea | Human Rights Watch. Hrw.org. Retrieved on 5 May 2013. ^ Equatorial Guinea: Ignorance worth fistfuls of dollars. Freedom House (13 June 2012). Retrieved on 2017-01-19. 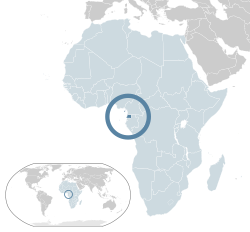 ^ Tension Builds in the Gulf of Guinea as Competition for Economic Resources Increases. Jutiagroup.com (5 April 2010). Retrieved on 5 May 2013. ^ L3 Communications coast surveillance contract with Equatorial Guinea could be worth $250M. Business.gaeatimes.com (24 February 2010). Retrieved on 5 May 2013. ^ Factoria Audiovisual S.R.L. "Declaración de la Unión Africana, sobre la supervisión de los comicios electorales – Página Oficial de la Oficina de Información y Prensa de Guinea Ecuatorial". Guineaecuatorialpress.com. Retrieved 3 May 2010. ^ "UPDATE 1-Tang renamed as Equatorial Guinea PM | News by Country | Reuters". Af.reuters.com. 12 January 2010. Retrieved 3 May 2010. ^ "Equatorial Guinea country profile". BBC News. 8 May 2018. ^ a b c d Equatorial Guinea Minister Seeks Strong Ties With U.S. Voanews.com (4 April 2010). Retrieved on 5 May 2013. ^ Birrell, Ian (23 October 2011). "The strange and evil world of Equatorial Guinea". London: The Guardian. ^ Ignacio Milam Tang, new Vice President of the Nation. guineaecuatorialpress.com. 22 May 2012. ^ Interview with President Teodoro Obiang of Equatorial Guinea. CNN. 5 October 2012. ^ "Convocatorial de Manifestacion, 25 de Junio 2013" (PDF). cpds-gq.org. Archived from the original (PDF) on 21 February 2014. ^ Nations Encyclopedia. Nations Encyclopedia (10 April 2011). Retrieved on 5 May 2013. ^ a b Law, Gwillim (22 March 2016). "Provinces of Equatorial Guinea". Statoids. Retrieved 25 September 2017. ^ "El Gobierno inicia sus actividades en Djibloho" (in Spanish). PDGE. 7 February 2017. Retrieved 25 September 2017. ^ "La Presidencia de la República sanciona dos nuevas leyes" (in Spanish). Equatorial Guinea Press and Information Office. 23 June 2017. Retrieved 25 September 2017. ^ "Equatorial Guinea government moves to new city in rainforest". BBC News. 8 February 2017. Retrieved 25 September 2017. ^ Law, Gwillim (22 April 2016). 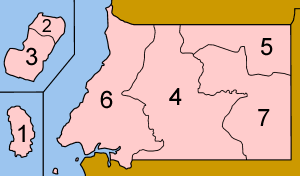 "Districts of Equatorial Guinea". Statoids. Retrieved 25 September 2017. ^ a b c "Equatorial Guinea". equatorialguinea.org. Archived from the original on 3 October 1999. Retrieved 3 May 2010. ^ Justin Blum (7 September 2004). "U.S. Oil Firms Entwined in Equatorial Guinea Deals". washingtonpost.com. Retrieved 9 July 2008. ^ "Inner City Press / Finance Watch: "Follow the Money, Watchdog the Regulators"". Innercitypress.org. Retrieved 3 May 2010. ^ Glenday, Craig (2013). Guinness Book of Records 2014. p. 123. ISBN 978-1-908843-15-9. ^ Equatorial Guinea | EITI Archived 13 May 2010 at the Wayback Machine. Eitransparency.org (27 September 2007). Retrieved on 5 May 2013. ^ "50 Things You Didn't Know About Africa" (PDF). World Bank. Archived from the original (PDF) on 25 July 2013. Retrieved 7 May 2012. ^ List of banned EU air carriers Archived 21 April 2012 at WebCite. Ec.europa.eu. Retrieved on 5 May 2013. ^ Vines, Alex (2009). Well Oiled: Oil and Human Rights in Equatorial Guinea. Human Rights Watch. p. 9. ISBN 1-56432-516-4. Retrieved 19 December 2012. ^ "Equatorial Guinea's God". BBC. 26 July 2003. Retrieved 26 May 2011. ^ Minahan, James (2002). Encyclopedia of the Stateless Nations: A-C. Greenwood Publishing Group. p. 330. ISBN 0-313-32109-4. ^ "Guiné Equatorial" (in Portuguese). CPLP. Retrieved 28 November 2014. ^ a b c d "Formação de professores e programas televisivos introduzem português na Guiné-Equatorial" [Teacher formation and television programs introduce Portuguese in Equatorial Guinea] (in Portuguese). Sol. 5 February 2014. ^ Oficina de Información y Prensa de Guinea Ecuatorial, Ministerio de Información, Cultura y Turismo. Guineaecuatorialpress.com. Retrieved on 5 May 2013. ^ "Fa d'Ambu". Ethnologue. Retrieved 15 November 2010. ^ "Equatorial Guinea Adds Portuguese as the Country's Third Official Language". PRNewsWire. 14 October 2011. Retrieved 15 November 2010. ^ "El portugués será el tercer idioma oficial de la República de Guinea Ecuatorial" (in Spanish). Gobierno de la Republica de Guinea Ecuatoria. Retrieved 15 November 2010. ^ "Proyecto de Ley Constitucional" (PDF). Gobierno de la Republica de Guinea Ecuatorial. 14 October 2011. Retrieved 15 November 2010. ^ "Portuguese will be the third official language of the Republic of Equatorial Guinea". Guinea Ecuatorial Press, (20 July 2010). Retrieved on 5 May 2013. ^ María Jesús Nsang Nguema (Prensa Presidencial) (15 October 2011). "S. E. Obiang Nguema Mbasogo clausura el Segundo Periodo Ordinario de Sesiones del pleno de la Cámara de Representantes del Pueblo" [President Obiang closes second session period of parliament] (in Spanish). Oficina de Información y Prensa de Guinea Ecuatorial (D. G. Base Internet). Retrieved 27 March 2012. ^ "Assinado termo de cooperação entre IILP e Guiné Equatorial" [Protocol signed on cooperation between IILP and Guinea Equatorial] (in Portuguese). Instituto Internacional de Língua Portuguesa. 7 February 2012. Retrieved 27 March 2012. ^ "Protocolo de Cooperação entre a Guiné-Equatorial e o IILP" [Protocol on cooperation between IILP and Guinea Equatorial] (in Portuguese). CPLP. 7 February 2012. Retrieved 27 March 2012. This note contains a link to the text of the protocol in PDF format. ^ "CPLP vai ajudar Guiné-Equatorial a "assimilar valores"" (in Portuguese). Expresso. 20 September 2014. Retrieved 24 November 2012. ^ "Nota informativa: Missão da CPLP à Guiné Equatorial" (in Portuguese). CPLP. 3 May 2011. Retrieved 27 March 2012. ^ "International Religious Freedom Report for 2017". ^ Steketee, R. W. (2009). "Good news in malaria control... Now what?". The American Journal of Tropical Medicine and Hygiene. 80 (6): 879–880. PMID 19478241. ^ Marked Increase in Child Survival after Four Years of Intensive Malaria Control. Ajtmh.org. Retrieved on 5 May 2013. ^ "Detection of poliovirus in São Paulo airport sewage: WHO". Brazil News.Net. Archived from the original on 10 July 2014. Retrieved 23 June 2014. ^ Equatorial Guinea – intangible heritage – Culture Sector. UNESCO. Retrieved on 19 January 2017. ^ Memory of the World | United Nations Educational, Scientific and Cultural Organization. Unesco.org. Retrieved on 19 January 2017. ^ "Country Profile: Equatorial Guinea: Media". BBC News. 26 January 2008. ^ "TVGE Internacional". LyngSat. Retrieved 28 March 2012. ^ "GSMWorld Providers: Equatorial Guinea". GSM World. 2008. Archived from the original on 14 April 2008. ^ "GSMWorld GETESA Coverage Map". GSM World. 2008. Archived from the original on 8 January 2009. ^ O'Mahony, Jennifer (27 July 2012). "London 2012 Olympics: how Eric 'the Eel' Moussambani inspired a generation in swimming pool at Sydney Games". Daily Telegraph. Archived from the original on 20 April 2005. Retrieved 18 December 2012. ^ "'Paula the Crawler' sets record". BBC News. 22 September 2000. Retrieved 18 December 2012. Max Liniger-Goumaz, Small Is Not Always Beautiful: The Story of Equatorial Guinea (French 1986, translated 1989) ISBN 0-389-20861-2. Ibrahim K. Sundiata, Equatorial Guinea: Colonialism, State Terror, and the Search for Stability (1990, Boulder: Westview Press) ISBN 0-8133-0429-6. Robert Klitgaard. 1990. Tropical Gangsters. New York: Basic Books. (World Bank economist tries to assist pre-oil Equatorial Guinea) ISBN 0-465-08760-4. D.L. Claret. Cien años de evangelización en Guinea Ecuatorial (1883–1983) / One Hundred Years of Evangelism in Equatorial Guinea (1983, Barcelona: Claretian Missionaries). Adam Roberts, The Wonga Coup: Guns, Thugs and a Ruthless Determination to Create Mayhem in an Oil-Rich Corner of Africa (2006, PublicAffairs) ISBN 1-58648-371-4. Web dossier Equatorial Guinea from the Afrika-Studiecentrum Leiden Library. "Equatorial Guinea". The World Factbook. Central Intelligence Agency.